Indian food is all about the – not-so-optional – extras. A curry isn’t as it should be without a hastily torn handful of flatbread, a refreshing salsa or a dollop of homemade mango chutney. Even better, why not create something a little more complex, such as a bowl full of crispy onion bhajis, or – yes, you guessed it – vibrantly-coloured Spinach Pakoras. These are the additions that truly make a dish into a meal. 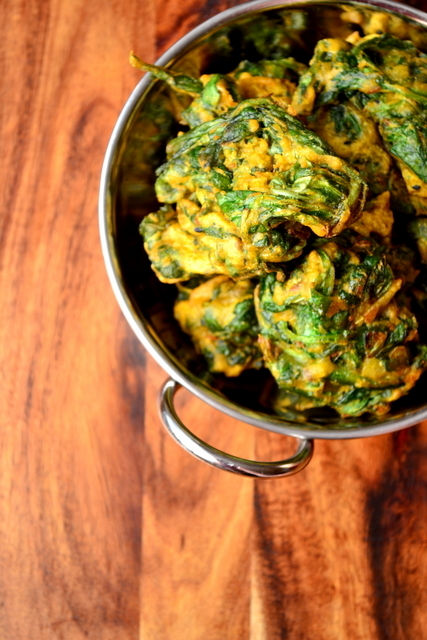 Similar, in a way, to my recipe for spinach fritters, this recipe for spinach pakoras is packed full of fragrant whole and freshly-ground spices. The difference is clear, however, with the spinach quickly wilted and then deep-fried. This approach makes for an entirely different culinary experience, resulting in very succulent bites of powerfully-flavoured greens. If there’s one thing you need to make sure of when making spinach pakoras it’s the temperature of your oil. Too hot and your oil will burn the pakoras before they are cooked through; too cold and the oil will penetrate the food, making for a soggy, unhealthy mass, good only for the bin. To get things just right and your batter crispy test the oil first by testing a little of the batter over a medium temperature. If it begins to bubble immediately proceed, if not be more patient! Heat a little sunflower oil in a large pan and gently toast the kalonji seeds, mustard seeds and garlic. 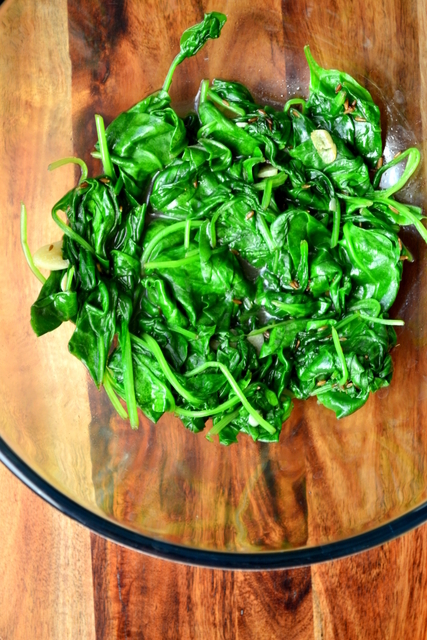 After around 1 minute add the spinach and allow to wilt. Transfer to a large mixing bowl. In a wok or deep pan heat up 2-3 inches of sunflower oil (see above for hint and tips). Meanwhile, add the cumin, coriander, turmeric, salt and gram flour to the wilted spinach and beat thoroughly. If necessary, add a dash or two of water until you have achieved a firm batter. Using a dessert spoon measure out the spinach batter and deep fry three at a time. Each pakora should take 2-3 minutes to cook through – be careful to let them burn. 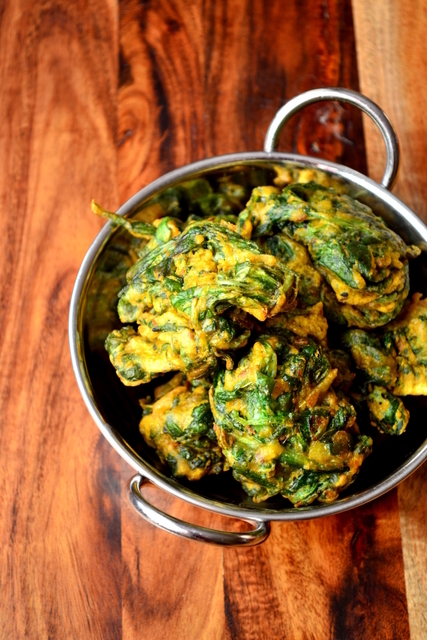 Once cooked, transfer the pakoras to a plate, using kitchen roll to soak up any excess oil. Serve immediately. 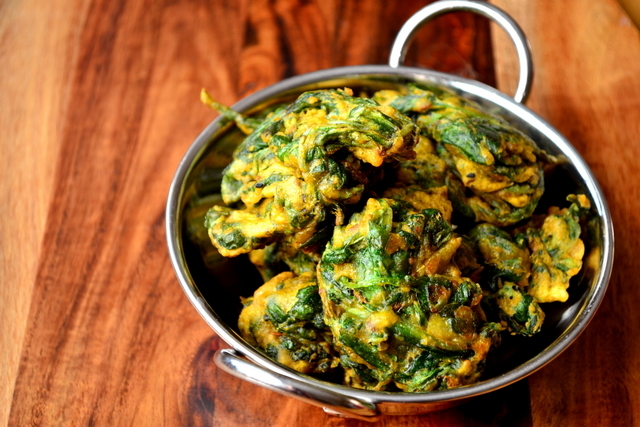 Cost: As with most Indian condiments, spinach pakoras are extremely inexpensive to make at home and usually prove even cheaper than the horribly dry renditions on offer at your local “super” market. Indeed, 8 of these beauties should set you back no more than £1.50 (not including the oil for frying, which can be re-used. These look great! The pakoras that I have eaten are 95% batter, these look like there is only just enough batter to hold them together. Thank you! The batter is great, but the spinach should be the main part. you forgot the most important ingredient for pakoras, spinach or otherwise, RAIN!! Pakoras are a staple choice for the rainy season here. Ask anyone. Those are gorgeous looking pakoras btw. Haha – only sun here, unfortunately. Glad you like them! These look gorgeous. I love how they are still so fresh and green looking after being cooked. That’s deep frying for you – very quick. wow these look delicious.. i can never go past good indian style food. love it! I’m all about the Indian food, it features twice weekly on our menu! These really are the best thing ever on a cold, crappy day. Total comfort food. Plus, if its vegetarian, I can eat many. right? All the Pakoras! Absolutely! I’ll be making more this week for sure! So happy I stumbled across your blog! Super cool. Can’t wait to read more. I become a wife in a month, and have found myself (hardly a chef) being so enamored with finding cool and unique recipes. Thank you – of course! Me too. I cant get enough. This looks amazing. You have a fantastic blog. Great photography. Emma. I’m glad you think so! Thank you very much. Just done these and the Bhajis…… Oh my!!! !